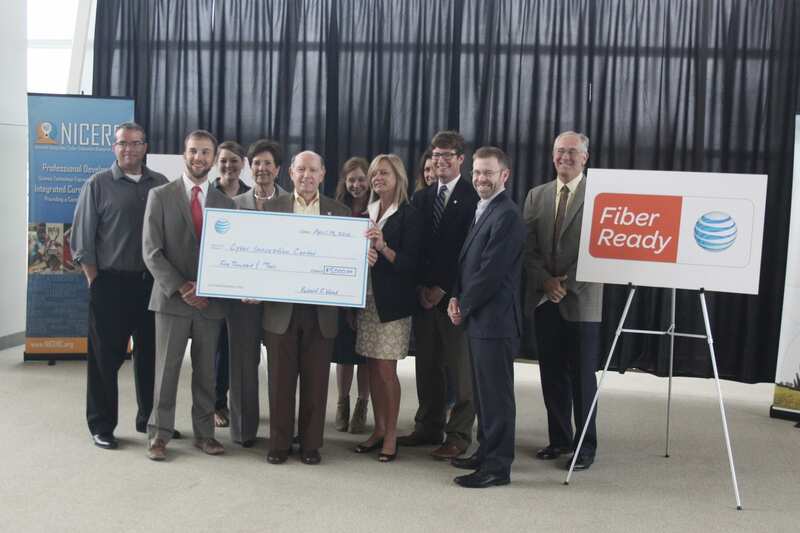 Efforts to keep local students connected to a positive future got a boost as AT&T, which has been connecting people for well over a century, contributed $5,000 to the Cyber Innovation Center (CIC). AT&T’s contribution will support the CIC’s existing academic outreach and workforce development program, which includes professional development, curricula, camps, and competitions that engage students in cyber and science, technology, engineering, and mathematics (STEM) disciplines. Many of the CIC’s efforts, like the Regional Autonomous Robotics Circuit (RARC), allow students to participate in hands-on cyber and STEM projects that encourage critical thinking and teamwork. These cyber, STEM, and 21st century skills will help students succeed in their academic careers as well as future professional endeavors. The Cyber Innovation Center’s mission is to promote the creation of a knowledge-based technology workforce and help diversify the region’s economic base by promoting research, education, and technology among many partnering organizations, businesses, and educational institutions. Currently, public, private, and charter schools in Bossier, Bienville, Caddo, Catahoula, Desoto, Lincoln, Madison, Morehouse, Natchitoches, Ouachita, Richland, Sabine, Union, and Webster Parishes in North Louisiana participate in the CIC’s academic outreach and workforce development program. Eighteen additional parishes in Central and South Louisiana also benefit from the program. Any schools or parishes interested in implementing the CIC’s programs can visit www.nicerc.org for more information.